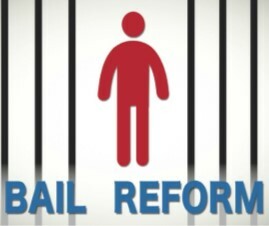 LOS ANGELES – The American Civil Liberties Union of California announced Monday it is opposing a bail-system-overhaul bill awaiting an Assembly vote, saying the proposed legislation as amended compromises the organization’s values of due process and racial justice. “After further serious consideration, the ACLU of California has changed its position on recently amended SB 10 to oppose. As much as we would welcome an end to the predatory lending practices of the for-profit bail industry, SB 10 cannot promise a system with a substantial reduction in pretrial detention. Neither can SB 10 provide sufficient due process nor adequately protect against racial biases and disparities that permeate our justice system,” according to the civil-rights group. The ACLU was an original backer of the proposed legislation to change the state’s bail system, but last week withdrew its support and took a neutral position, before Monday’s announcement of opposition to the bill. The bill’s sponsor, Sen. Robert Hertzberg, D-Van Nuys, said Monday he continues to stand by it, as do several of its original supporters. Community organizers protested outside the criminal courts building in downtown Los Angeles Monday, saying the proposed bill would replace the current money bail system with one that relies too heavily on algorithms to assess the risk of keeping criminal defendants behind bars while awaiting trial. Those algorithms are “incredibly inaccurate,” according to John Raphling, a senior researcher on criminal justice for Human Rights Watch. The scoring system uses ZIP codes, housing status and employment data as proxies for race and economic status and would continue to penalize low- income and minority defendants, according to Raphling and Pete White, executive director of the Los Angeles Community Action Network. Backers of the bill say that quantitative data would play only one part in assessing the danger posed by any individual defendant because judges would have access to other information. The bill requires local courts to set up systems to identify individuals who are a risk to public safety or at risk of missing their court date, but allows jurisdictions to dictate the specifics, rather than taking a one-size-fits-all approach. However, it also presumes that individuals charged with a violent felony pose a risk to public safety, an assumption the ACLU California found too broad, according to Norma Chavez Peterson, the executive director for ACLU affiliates in San Diego and Imperial counties. White and others who oppose the bill said they are concerned SB 10 will only increase the number of people behind bars awaiting trial. They propose a plan dubbed PPI for “preserving the presumption of innocence,” and say no one should be held in jail without a hearing based on solid evidence of their crime.